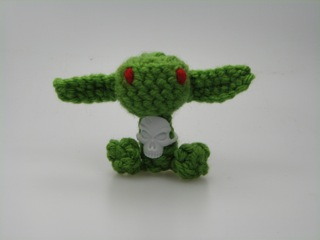 Christmas at Paizo with James Sutter ~ Perfect Gifts for Gamers! 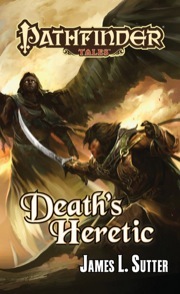 Celebrating a Gothic Christmas with us is James Sutter – author of Death’s Heretic and senior editor at Paizo Publishing, creators of the Pathfinder Roleplaying Game. This is a particularly exciting guest for us, weekend Pathfinder games are a family tradition you see. The kids even get their chores done early just to nab extra time rolling dice, fighting beasties and enjoying our party’s pet goblin, Itchet’s, pranks! 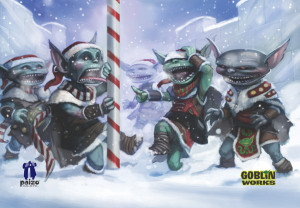 Today James tells us a bit about Christmas at Paizo. Take it away James! Paizo as a company has a variety of winter traditions, from the seemingly annual “we all got snowed in at the office and have to live off whatever food’s in our desks” to the far more pleasant “it snowed half an inch so I’m panicking and working from home.” There’s also the ever-popular Paizo Holiday Card with its absurd holiday-themed art and discounts for anybody with a paizo.com account. But by far the biggest holiday tradition for us is the Paizo Holiday Party. Once upon a time, that took place in the house of our owners, Vic Wertz and Lisa Stevens–a structure that is possibly the world’s greatest shrine to Star Wars not actively owned by George Lucas. Now that the company’s grown so much, however, we have it at a winery (with this year’s party featuring the first official goblin wine!). Though we’re all a bit older and calmer than we used to be–I was 20 when I started at Paizo eight years ago–putting all of us in a room together still results in some serious decibels, especially once you add in the traditional white elephant or secret Santa gift exchanges. When it comes to our personal celebrations of Christmas/Hannukah/Festivus/Solstice/etc., most of us are pretty standard, spending that time hanging out with family and friends and eating a lot of food. (Our respective New Years’ parties are probably a bit more interesting–one year my roommates transformed the entire house into a steampunk dirigible, the HMS Incorrigible, with all the guests dressing up as its crew.) 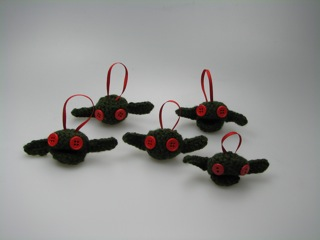 For us, the coolest and craziest thing about the holidays is probably the fans that decide to send us presents–check out these amazing goblin and flumph tree ornaments made for us by Amanda M! Happy holidays everyone, and thanks so much for being part of the Pathfinder community! Thanks for joining us here today James, we appreciate all the hard work Paizo puts into making Pathfinder great. Happy Holidays to all of you guys! Speaking of Pathfinder – Lain and I are gamers from back when the original Gygax was around and AD&D was first getting its scaly legs. 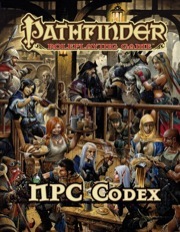 Then we found Pathfinder and discovered it’s a lot like D&D 3.5, only better! It was the best investment we’ve made. So for the gamer in your life, I can’t recommend these high enough. This has everything you need to start playing. Excellent gift! Spiffy time saver for the GM in your life, lots of goodies in here to throw at her victims...er...I mean Players. 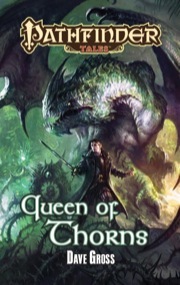 The newest release from Pathfinder Tales by Dave Gross for the fantasy lover on your list! Before we had kids, we would take one Saturday in December and play AD&D for 24 hours straight. No sleeping. No breaks. From 6 p.m. Saturday until 6 p.m. Sunday. Those were the days. That would be fun! Guessing lots of pop and coffee were consumed?